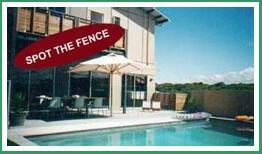 Here at Axis/Caloundra Glass we will taylor design a stunning glass pool fence to suit your needs. ...for when you want to keep the VIEW - with SAFETY! Glass fences and gates from Axis are unique - each designed to achieve maximum views with minimal obstruction while also providing a completely SAFE environment. We are Licenced Glaziers, not just fencing contractors, so we are able to design and build your fence to Australian Standards (AS1288 - Glass in Buildings) in terms of engineering and safety for Human Impact and Wind Load. Our ability to engineer your fence for your specific situation produces a unique, final result with quality and style matched by few others. We can design and construct fences & gates that are completely frameless (with no visible supports) or semi-frameless (with the maximum spans possible between posts). We only use polished, toughened, safety glass. 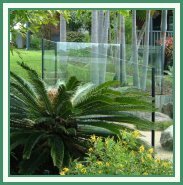 As qualified and Licenced Glaziers, we are able to issue formal certification (a "Glass Certificate" - required by local Councils) that the fence has been engineered and constructed to meet the stringent requirements of Australian Standards. 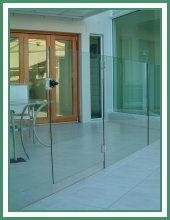 Quite apart from the technical aspects and the uninterrupted view, no other home expenditure has quite the same dramatic and immediate effect in terms of the additional quality, style and increased value that is given by a properly engineered, constructed and certified, polished glass fence. No obstruction to the view - just see through toughened safety glass. Polished edges reflect quality and style. 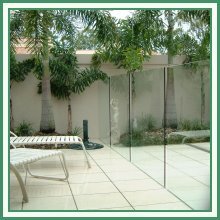 Frameless glass fences are set with high-performance, non-shrink grout into a supporting channel (steel or concrete). Be safe and keep the view. Semi-frameless glass fences are fitted to 50mm diameter aluminium posts (with caps & collars plus internal glazing channels - not channels added to the outside of the post). Our unique construction processes make our fences structurally stronger than glazing with rubber/vinyl. We can SPAN OVER 2 METRES between posts by engineering the glass to suit - giving you maximum views and minimum obstruction! Our gates are completely frameless for maximum views. They can be hinged & latched directly from other glass panels or posts or existing masonry. We use self-closing, plated, solid-brass hinges with stainless steel springs - not plastic hinges. We recommend "Reachover" side-pull, magna latches for ultimate child safety. We are committed to service and quality and we have the ability to provide it for you. or talk to one of our staff on 5491 8888 for a free measure and quote.